If you vape, you’ve probably got more than a couple pieces of vape gear. You need an assortment of batteries, perhaps in different sizes. You need chargers, lanyards, e-liquids and/ or cartridges, among other accessories. You need stuff. And more stuff than you probably did when you were smoking cigarettes. So, with all of these things comes the need for some organizing, because when you want something, the last thing you want is to have to search all over creation for it! This is why e-cigarette organizing was invented. It was born of need, people! So, with that in mind, this is what you will need to keep all of your gear in place and safe. Side Note- if you have kids or pets, do not, let me repeat, do not allow them access to your vaping products, particularly the e-liquids and cartridges. Results can be nasty. Padded, zippered, and designed with a slew of different slots to fit all of your necessaries, this one is a basic, do-it-all, no-nonsense way to stash your gear and ensure it’s all safe. Sleek and stylish, this case is more than just all-purpose. It holds the necessities: a couple of batteries and cartridges and can fit in a pocket. If you vape, you’ve probably got gear. In this case, keep it all safe, all organized, all together and ready for action with the right case! We offer a variety of ways to keep all of your stuff organized and together. 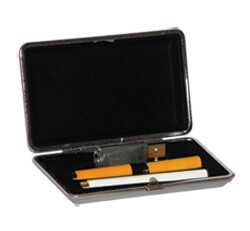 Of course, while these cases were designed with your e-cigs in mind, you also have the option of using all types of organization containers for your needs. You know, do what you gotta do! Tackle boxes, cosmetic cases, art supplies containers; whatever floats your boat, just make sure it is what makes life simpler for you.